Recommended citation: Ito M, Srirat T, Nakamura T, Komai K, Yoshimura A. Ischemic Brain Injury and Regulatory T Cells. OBM Neurobiology 2019;3(1):19; doi:10.21926/obm.neurobiol.1901023. Inflammation and immune responses after stroke, including ischemic cerebral infarction, play pivotal roles in the pathology, resolution of inflammation, and neurological recovery. Regulatory T (Treg) cells are the cells responsible for immune tolerance, usually activated by secondary lymphatic tissues, which subsequently regulate effector T cell activation and dendritic cell activation. Recently, Tregs that are present in tissues, called tissue Tregs, have been shown to exhibit tissue-specific functions in addition to immune regulation, contributing to the maintenance of homeostasis and tissue repair. We found that Tregs accumulate in the brain at the chronic phase of ischemic brain injury and control astrogliosis through the secretion of amphiregulin. Unlike other tissue Tregs, brain Tregs express a serotonin receptor (Htr7) that is characteristic of the nervous system, and are proliferated and activated by serotonin. Administering a serotonin or selective serotonin reuptake inhibitor (SSRI) in an experimental stroke mouse model increased the number of brain Tregs and improved neurological symptoms. Elucidation of the significance of brain Tregs should also contribute to the understanding of other types of neuroinflammation. Stroke is the leading cause of death and disability around the world . Even if patients survive a stroke, most suffer from various long-term neurological defects and impaired daily activity. In aging societies, there is a concern that the number of patients suffering from stroke will continue to increase. Stroke causes neuronal cell death and destruction of neuronal circuits, resulting in impaired movement, sensation, and/or higher brain function. Approximately 70 to 80% of strokes consist of ischemic cerebral infarction. Ischemic death of the brain tissue induces inflammation and cerebral edema that exacerbates functional prognosis. Thrombolytic therapy through the intravenous administration of recombinant tissue-plasminogen activator (rt-PA) within 4.5 hours after the onset of stroke, along with surgical thrombectomy, alleviates ischemic brain damage. Rehabilitation is the main treatment for promoting functional recovery for most ischemic stroke patients. Sterile inflammation is usually associated with tissue injury and cell death. In the case of a stroke, inflammation occurs both in mice and humans, and neuroinflammation has been suggested as an attractive treatment target in stroke [2,3,4]. To date, innate cells including microglia, macrophages, and γδT cells have been thought to play major roles in neuroinflammation after stroke, since inflammation is obvious within a few days after stroke onset, while few symptoms of inflammation are observed 1 week after stroke. However, we and others have identified a massive accumulation of lymphoid cells including regulatory T cells (Tregs) in the chronic phase more than 2 weeks after stroke onset [5,6]. Tregs express the transcription factor Forkhead box P3 (Foxp3) as a major master transcription factor and suppress excessive immune responses against various antigens such as self-antigens, antigens derived from commensal bacteria, and foreign antigens. Tregs are generated mainly via two different routes. The first is direct development in the thymus from CD4 and CD8 double positive (DP) thymocytes. Tregs developed via this route are called thymus-derived Tregs (tTregs) or naturally occurring Tregs (nTregs). tTregs are believed to develop from precursor thymic T cells that have recognized self-antigen-MHC complexes on thymic antigen-presenting cells (APCs) with relatively high avidity. Therefore, tTregs express a T cell receptor (TCR) repertoire with a bias for self, and are particularly important in the prevention of autoimmunity [7,8]. It is estimated that tTregs compose most of the systemic Treg population. The second route of Treg generation is differentiation from naïve CD4+ T cells in the periphery upon reception of antigen stimulation with an appropriate combination of cytokines, including IL-2 and TGF-β . Tregs produced in this way are called peripherally induced Tregs (pTregs). Although pTregs represent only a small percentage of overall Tregs, this subset is highly enriched in certain organs, including the gut and maternal placenta . Previous studies have focused mainly on activated effector T cells, dendritic cells, and macrophages as targets suppressed by Tregs. However, in recent years, Tregs localized in non-lymphoid tissues during a steady state or injury have attracted attention. They are called tissue Tregs and exhibit a common property; whereas they also have characteristics specialized for each tissue . In this review article, we will focus on the role of brain-specific tissue Tregs in the central nervous system. Brain swelling, which is often fatal in ischemic stroke patients, occurs early in the stroke due to endothelial cell injury, which allows the infiltration of mononuclear cells including macrophages, neutrophils, and lymphocytes (Figure 1 and Figure 2). In the early stages of inflammation (around 24 hours after stroke onset), macrophages are activated by molecules in so-called DAMPs (danger-associated molecular patterns) released from necrotic cells, which then produce inflammatory cytokines and mediators that increase ischemic encephalopathy and blood-brain barrier (BBB) destruction. Major DAMPs are HMGB1, peroxiredoxins, and S100A8 and A9, which mostly activate TLR2 and TLR4 expressed on infiltrated macrophages [3,11]. Among cytokines released from M1-type inflammatory macrophages, TNFα and IL-1β have been shown to directly induce apoptosis of neural cells, and IL-23 and IL-1β stimulate IL-17 production from infiltrated γδT cells . IL-17 does not show a direct neurotoxic effect, yet it promotes inflammation, neutrophil accumulation, and BBB destruction by activating endothelial cells . To secrete mature IL-1β, inflammasome must be activated in macrophages. We and others have shown that inhibition of inflammasome is one way to reduce neuroinflammation and infarct volume growth after stroke [14,15] (Figure 1 and 2). After 3-4 days, infiltrated M1-type macrophages are converted into M2-type repairing macrophages, which facilitate scavenging necrotic cells and tissue debris, and support neural repair by producing tropic cytokines such as IGF-I (Figure 2). We identified Msr1 as a major scavenger receptor for the clearance of DAMPs [16,17]. Importantly, Maf-b has been found to activate Msr1 promoter, and RAR agonist, Am80, which up-regulates MAF-B expression and promotes clearance of DAMPs and facilitates neurological recovery . Thus, 7 days after stroke onset, inflammation has been resolved, and it is believed to have no strong impact on the neural recovery after stroke (Figure 2). Lack of CCR5 increased the severity of brain injury following occlusion of the middle cerebral artery . CCR5 is uniquely expressed in cortical neurons after stroke . CCR5 antagonist, devised for HIV treatment, accelerated recovery from neurological impairments and cognitive function. Various roles of CCR5 in neurons are reported, but the inhibition of CCR5 reported to suppress astrocyte reactivity and macrophage recruitment. Figure 1 Schematic showing a time-dependent recruitment of inflammatory cells into the brain following focal cerebral ischemia in mice. In this review, we call day 1-3 after stroke the onset acute phase, day 3-7 the subacute phase, and periods after 2 weeks the chronic phase. This figure shows conceptual changes of infiltration and accumulation of immune cells, thus the numbers of each immune cell are not necessarily accurate. Figure 2 Schematic view of the role of immune cell types in cytokine production, neuroinflammation, and tissue repair. In the early stages (around 24 hours), macrophages infiltrate the injured brain and are activated through the TLR2/4 stimulation by molecules in so-called DAMPs (danger-associated molecular patterns) released from necrotic cells. They then produce inflammatory cytokines and mediators that increase ischemic encephalopathy and blood-brain barrier (BBB) destruction. At this stage, macrophages are M1-type inflammatory macrophages. Then IL-23 and IL-1β from inflammatory macrophages stimulate IL-17 production from infiltrated γδT cells . After day 3, macrophages are converted into M2-type repairing macrophages and are involved in clearing DAMPs, resolving inflammation, and tissue repair. During the chronic phase, a massive T cell infiltration occurs. Brain Tregs are attracted through chemokines and proliferate in the cervical LN and the brain. Brain Tregs may interact with various brain cells including astrocytes, microglia, endothelial cells, and neural cells and promote neural cell recovep. T cells and B cells are also important to the pathophysiology of stroke . B cells and antibodies are present in and around the stroke core in some human patients who died of stroke and dementia, and also in mice that are subjected to experimental stroke. Although there have been several reports showing that B cell activation and autoantibody production leads to post-stroke cognitive impairment, little is known about the role of B cells and antibodies in brain inflammation and neurological deficits . T cells have been more intensively investigated, since cytokines, such as TNF-α, IFN-γ, IL-17, IL-21, and IL-10 from CD4+T cells and γδT cells affect glial cells, neurons, other immune cells, and endothelial cells [22,23] (Figure 2). Tregs suppress unwanted immunity against a variety of antigens, including self-antigens, commensal bacteria-derived antigens, and environmental allergens . Treg-mediated immune suppression against such antigens is important for preventing the development of autoimmunity, colitis, and allergies [25,26,27]. Various mechanisms of immune suppression by Tregs have been demonstrated including IL-2 consumption by CD25 expression, suppression of co-stimulation by CTLA4 expression, and suppression of inflammation by anti-inflammatory cytokine IL-10 and TGFβ [28,29]. Previously, Tregs infiltrated into the brain were reported to suppress neuroinflammation and reduce the severity of experimental stroke at the acute phase . However, the role of Tregs in stroke has become controversial [31,32]. 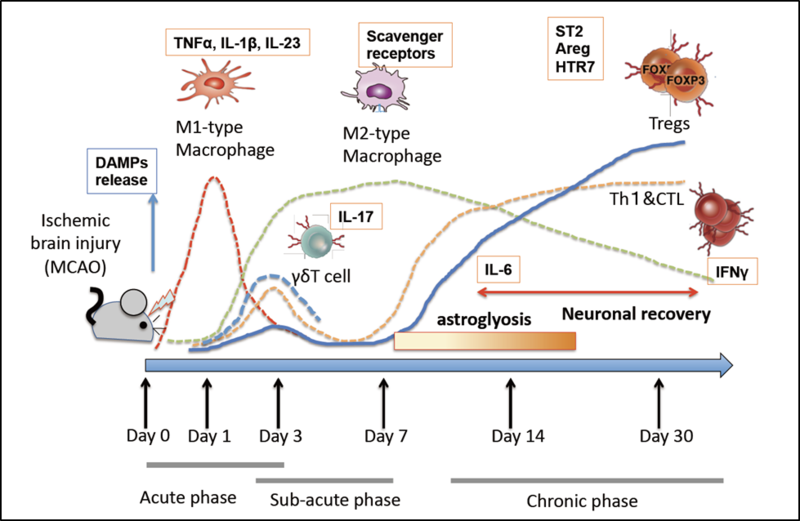 This is mostly because the number of Tregs in the brain is extremely low (less than 100 cells/brain), and antigen-specific proliferation and activation of Tregs may not occur in such a short period (within 3 days) (Figure 1). Therefore, only a bystander effect, such as secretion of IL-10, may be observed at the acute phase. Nevertheless, several studies of human stroke patients have suggested a positive correlation between the number of peripheral Tregs or the Treg/Th17 ratio and the severity of stroke [33,34,35]. Tregs usually represent about 10% of CD4+ T cells and have been proposed to exist in lymphoid tissues and sites of inflammation; however, it has recently been discovered that they accumulate in various tissues besides lymphoid tissues. Tissue Tregs recognize the self-antigen characteristic of the tissues and have a limited TCR repertoire. Such tissue-resident Tregs (fats, muscles, skin, lungs, intestines, etc.) exhibit phenotypes quite different from lymphoid tissue [10,36,37] (Table 1). The features common to various tissue Tregs are: high expression of genes such as Il10, Il1rl1 (encoding ST2, IL-33 receptor), Areg (amphiregulin), Klrg1, Ctla4, Tigit, Gata3, Batf, and Irf4; and low expression of Lef1, Tcf7, and Bcl2 compared with lymphatic tissue Tregs [36,38]. Analysis of the A384T mutation of the Foxp3 gene has shown that BATF is an important regulator of tissue Tregs . On the other hand, the localized microenvironment seems to play pivotal roles in the phenotypes of tissue Tregs. Features of various tissue Tregs are shown in Table 1. Tregs of visceral adipose tissue (VAT) are one of the most intensively studied tissue Tregs. In VAT, Tregs occupy 40 to 80% of CD4+ T cells and localize in gaps between adipocytes . VAT Tregs have different transcriptomes from those of lymphoid tissue Tregs, and, in particular, VAT Tregs express PPARγ, which is a master regulator of adipocyte differentiation that is indispensable for the accumulation and phenotype of VAT Tregs [41,42]. Recently, transgenic mice with highly enriched TCR in VAT Tregs have been generated, and this study demonstrated that the VAT-Treg phenotype is partly acquired at a priming step in the spleen, and then moves to VAT and acquires the full VAT-Treg phenotype . In the skeletal muscle injury and Duchenne muscular dystrophy models, Tregs with a characteristic TCR repertoire accumulate in skeletal muscle [44,45]. IL-33 promotes the accumulation of muscle Tregs, while Treg-specific deletion of ST2 results in delayed muscle regeneration . It has been shown that amphiregulin (Areg), a low-affinity ligand for the epidermal growth factor (EGF) receptor, produced from muscle Tregs, promotes muscle repair by stimulating muscle satellite cells . Muscle Tregs also suppress excessive activation of tissue macrophages . Tregs also promote the regeneration of hearts damaged by myocardial infarction [48,49,50]. CCR5 is important for the infiltration of Tregs into the myocardium, and CCR5+ Tregs express high levels of IL-10. Tregs control excessive matrix degradation and harmful remodeling by regulating the expression and activities of MMP proteins . Lung Tregs control tissue damage caused by inflammation. Lung Tregs also reduce pulmonary CXCR4+ fibrocytes and prevent fibrosis by suppressing the expression of the ligand CXCL12 in the lung . Lung Tregs promote the proliferation of alveolar type II cells via CD103-mediated activation of E-cadherin expressed in epithelial cells . Also, after infection with an influenza virus, lung Tregs promote pulmonary function recovery by producing Areg and genes involved in the remodeling of the extracellular matrix and tissue repair . Numerous Tregs accumulate in the layers of the mouse and human skin. Thymus-derived Tregs migrate to the skin early in the neonatal period and establish immune tolerance to symbiotic microorganisms . Skin Tregs highly expressing CCR4, CCR6, and CCR8 are attracted by their ligands, CCL22 and CCL20, which are expressed in the skin, and accumulate around the hair follicles [56,57]. Interestingly, genome-wide association studies (GWAS) on alopecia areata have reported single nucleotide polymorphisms (SNPs) in CD25, CTLA4, and Eos genes that are important for Treg differentiation and function . Skin Tregs localize in the hair follicle stem cell niche and express Jag1, a Notch ligand, which promotes hair follicle stem cell proliferation and differentiation, along with hair follicle regeneration . Colon Tregs are roughly divided into thymus-derived Gata3+, Helios+ tTreg, and Helios- pTreg. Nearly 90% of colonic pTregs consist of RORγt+ Tregs. It has recently been reported that these RORγt+ pTregs are induced in response to intestinal microorganisms and regulate the local inflammatory response in a transcription factor c-Maf-dependent manner . On the other hand, Helios+ tTregs are less susceptible to the composition of intestinal microorganisms. The colonic Tregs express ST2, and IL-33 promotes the accumulation of Tregs in the colon . The Gata3+Helios+ colon Tregs are also considered to be involved in tissue repair with a high expression of Areg . The involvement of Treg cells in neuroinflammatory diseases such as multiple sclerosis (MS) has been intensively studied [62,63]. Tregs from MS patients have defects in their suppression ability owing to the decrease in expression level of CTLA-4, Foxp3, and other genes important for Treg function, which may be responsible for the onset of the disease . FOXP3 polymorphism has been reported to be associated with severity in male MS patients . A mouse model of experimental autoimmune encephalomyelitis (EAE) that mimics MS has worsened symptoms due to the deficiency or defect of Tregs . In mice lacking T cells, remyelination is inhibited after lysolecithin injection, suggesting that T cells are required for remyelination of the CNS . In the EAE model of Treg-deficient mice, remyelination and oligodendrocyte differentiation are impaired, but they are rescued by the transfer of Tregs . In this case, it has been reported that the secretory protein CCN3 produced from Tregs promotes the differentiation and myelination of oligodendrocyte precursor cells . However, the characteristics of Tregs in the brain have not been well elucidated because the number of Tregs in the brain and spinal cord is very small. In the experimental cerebral ischemia model, T cells infiltrate the brain at several time points after stroke onset (see Figure 1). CD8+ T cells are detected within several hours after stroke onset . γδ T cells increase immediately after stroke onset, then infiltrate into the brain parenchyma due to the BBB breakdown, and the number of γδ T cells peaks at 3 days after stroke onset [12,69]. CD4+T cells and NKT cells invade after 24 hours of ischemic brain injury . It has consistently been reported that the infarct lesion is reduced in mice lacking T cells, indicating that T cells promote brain damage after stroke [12,30]. Nerve-damaged substances such as granzyme and perforin secreted from CD8+T cells exacerbate infarction volume . IL-17 secreted from γδ T cells contributes to damage in the ischemic penumbra region [12,69]. Therefore, the infarct volumes decrease in γδ T cell-deficient mice and anti-IL-17 neutralizing antibody-treated mice [12,71]. In humans, blocking the infiltration of T cells into the brain by FTY720 (fingolimod) treatment within 3 days is effective for ameliorating neurological symptoms . By clarifying the dynamics of T cells during the chronic phase, there is a possibility that the therapeutic time window could be further expanded. It should be noted that the number of T cells within 1 week after stroke onset is very small and represents only a small percentage of infiltrated monocytes  (see Figure 1). However, T cells infiltrated during the acute phase play a progressive role in neuroinflammation and neuronal damage. Tregs have also been detected in the acute phase of brain injury, and have been shown to be protective. However, as discussed previously, the number of Tregs in the acute phase is extremely small, and the effect of Tregs is questionable [31,32]. 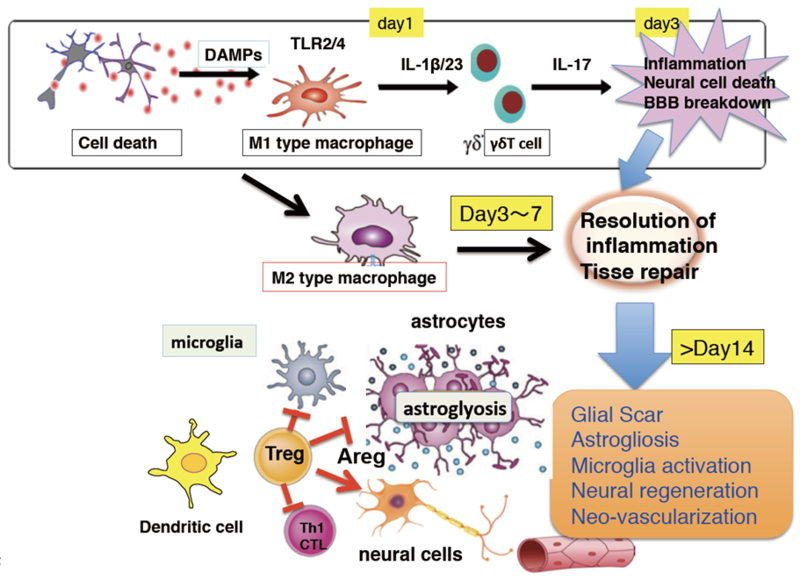 On the other hand, we and others have found that Tregs as well as other lymphocytes accumulate in the brain from 1 to 2 weeks after stroke onset in the murine MCAO model [5,6](Figure 1 and 3). Treg infiltration proceeds with slightly delayed kinetics from other T cells. Tregs also infiltrate the spinal cord parenchyma from the subacute phase to the chronic phase in the spinal cord injury model . Tregs account for approximately half of CD4+ T cells localized inside and around the cerebral infarction lesion in close proximity to scar-forming astrocytes and surviving neuronal cells (Figure 3). Treatment with FTY720 or anti-CD4 antibody in the chronic phase after stroke drastically decreased the number of CD4+T cells including Tregs in the brain, and neurological recovery was delayed. Furthermore, the depletion of Tregs using Foxp3-DTR mice in the chronic phase worsened neurological symptoms without affecting infarct volume, indicating that brain Tregs are important for ameliorating neurological symptoms . Stubbe et al. used anti-CD25 antibody to deplete Tregs, and they observed no changes regarding neurologic outcome . Anti-CD25 antibody, however, may not be able to completely deplete Tregs . Figure 3 Accumulation of Tregs in the chronic phase after stroke onset. In the chronic phase, T cells accumulate in the infarct lesion and its surroundings. 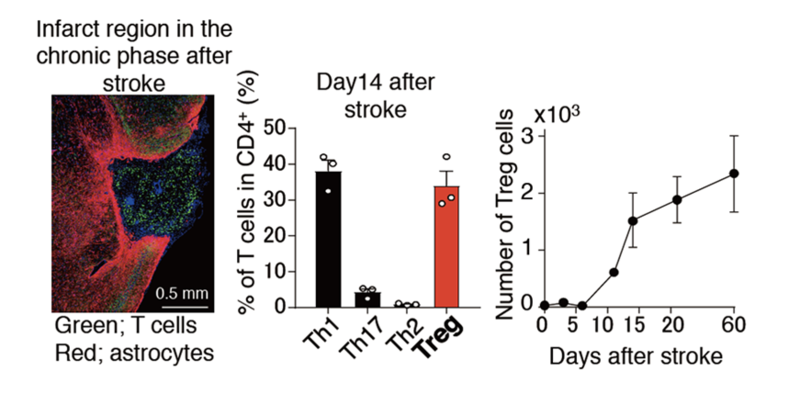 Tregs account for approximately half of the CD4+ T cells, infiltrate and increase in the brain in about 2 weeks after stroke onset, and continuously increase thereafter. Like other tissue Tregs, brain Tregs are Helios+ KLRG1+ and possess a unique TCR repertoire, and express high levels of CTLA-4, PD-1, Areg, and ST2. Moreover, TCR signal, IL-2, and IL-33 are essential for the proliferation of Tregs in the brain, which is very similar to the requirements of other tissue Tregs. IL-33 expressing cells in the brain are astrocytes and oligodendrocytes, and IL-33 promotes tissue recovery after CNS injury . Although mice lacking IL-33 have been reported to reduce the induction of M2 macrophage-related genes and fail to recover after CNS injury , it is highly possible that brain Tregs are also involved in the repair function of IL-33. On the other hand, brain Tregs express several unique genes such as CNS-related genes that are not present in other tissue Tregs. In particular, brain Tregs express serotonin receptor 7 (Htr7), which raises cAMP (Figure 4a) . It is known that cAMP promotes the proliferation of Tregs and potentiates their function . As expected, Tregs isolated from the ischemic brain during the chronic phase proliferated and activated in an Htr7-dependent manner. The administration of serotonin or a selective serotonin reuptake inhibitor (SSRI) during the chronic phase after stroke increased the number of brain Tregs and improved neurological symptoms (Figure 4b). Brain Tregs also expressed CCR6 and CCR8 and infiltrated the brain with the expression of CCL20 and CCL1 in the cerebral infarct. Intraventricular injection of CCL1 and CCL20 increased the number of Tregs, leading to improved neurological recovery. Figure 4 Expression of serotonin receptor 7 (HTR7) in brain Tregs and the therapeutic effect of serotonin or selective serotonin reuptake inhibitor (SSRI). (a) Expression levels of Htr7 were measured with quantitative RT-PCR. Tregs were isolated from the brain of mice with focal cerebral ischemia, from the spleen of normal mice, and TGFβ-induced Tregs in vitro. Brain Tregs, but not other Tregs, expressed Htr7. (b) The ischemic mice were administrated serotonin (5-HT) (2.5 mg kg-1) or PBS intraventricularly on day 7, 9, 11, and 12 or administrated fluoxetine (20 mg kg-1) intraperitoneally on day 7-13 after stroke onset. Flow cytometric analysis of the frequency of Tregs in CD4+ T cells from ischemic brains and neurological scores were determined on day 14. The depletion or reduction of brain Tregs caused excessive activation of astrocytes and apoptosis of neurons in the motor cortex (Figure 5). Excess activation of astrocytes, so-called astrogliosis, is thought to lead to a delay in the recovery of motor function after brain or spinal cord injury . Although astrogliosis is necessary for forming scars to protect neuronal cells from necrotic areas, excessive activation of astrocytes has been shown to increase neurotoxic factors, resulting in neural cell damage and inhibition of neuronal outgrowth . Treg-depletion experiments clarified that brain Tregs suppressed excessive activation of astrocytes. Inflammatory cytokines such as IL-6 are important for the activation of astrocytes , and brain Tregs suppressed IL-6 levels in vivo and in vitro (Figure 6). We characterized Areg as a suppressive factor for IL-6 production from microglia and astrocytes, since Areg is known to suppress the production of inflammatory cytokines, including IL-6 and TNFα . In vitro, brain Tregs suppressed IL-6 production from microglia and astrocytes in an Areg-dependent manner. The transfer of Tregs and intraventricular administration of Areg suppressed astrocyte activation, STAT3 phosphorylation, and improved neurological symptoms. Although the molecular mechanism by which Areg inhibits IL-6 production is unknown, Areg is an important functional molecule of brain Tregs. In addition, Areg may also be directly involved in the proliferation of neural stem cells . Figure 5 The effect of Treg depletion during the chronic phase after stroke on astrogliosis and neurological deficit. Foxp3-DTR (DEREG) or WT littermates were administered DT (diphtheria toxin) on day 7, 9, and 11 after stroke onset. Neurological scores and the GFAP+ areas were measured on day 14. Treg-depletion 7 days after stroke onset caused abnormal activation of astrocytes and exacerbation of neurological symptoms. Figure 6 Brain Tregs regulate astrogliosis by suppressing IL-6 production through Areg. (In vitro) Microglia and astrocytes isolated from adult mice were stimulated with brain lysates from sham-treated or ischemic mice in the presence or absence of Tregs isolated from the ischemic brains and anti-Areg antibody for 24 hours. The relative IL-6 mRNA expression levels. (In vivo) WT or Areg-/- Tregs (1 × 106 cells) were transferred into CD3ε-/- mice on day 5 after stroke onset. The GFAP+ areas and neurological scores were measured on day 14. It has not yet been demonstrated that Tregs are accumulated in the human brain of ischemic stroke patients. However, in human cerebral infarctions, a correlation between the number of Tregs, Treg/Th17 ratio, and IL-17/IL-10 levels in the peripheral blood and prognosis has been reported [34,35,83,84]. SSRI is known to ameliorate neurological symptoms after stroke onset [85,86]. It has also been reported that Tregs of MS patients proliferate by serotonin stimulation . Therefore, it is highly likely that brain Tregs work on neural repair in the chronic phase after stroke in humans. Accordingly, a pilot study of FTY720 (fingolimod) for stroke patients revealed that the administration of FTY720 was only effective within 3 days after stroke onset. It is known that neural inflammation occurs not only in cerebral infarction but also in various types of damage to cerebrospinal tissue such as spinal cord injury, in autoimmune diseases such as multiple sclerosis, and in neurodegenerative diseases such as Alzheimer's disease and Parkinson's disease. It is possible that various types of neural inflammation also trigger acquired immunity, and brain Tregs infiltrate and accumulate in the CNS, which plays an important role in relieving neurological symptoms. It has been shown that stroke patients showed greater immunoreactivity to brain antigens . Identification of self-antigens and induction of brain-specific Tregs may be useful therapies for relieving symptoms not only in cerebral infarction but also in other central nervous system diseases (Figure 7). Figure 7 Schematic view of the accumulation of brain Tregs and their nerve control mechanism. Brain Tregs are activated by recognizing self-antigens, infiltrate the brain in a chemokine-dependent manner, and then proliferate by interleukin (IL-2, IL-33) and serotonin and produce amphiregulin (Areg). Areg suppresses excessive activation of astrocyte by inhibiting the production of interleukin 6 (IL-6) from microglia and astrocytes, which protects neuronal cells. There may be other neuroprotective mechanisms involving brain Tregs. 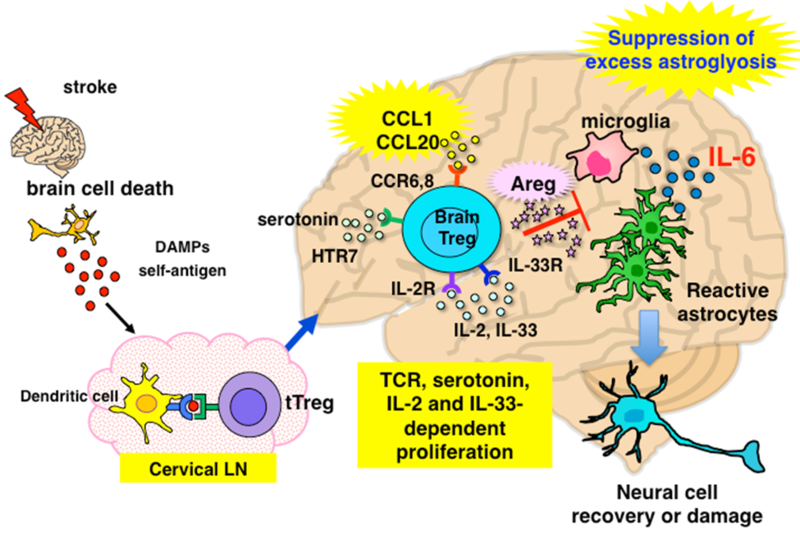 In summary, brain Tregs expand by recognizing self-antigens in the cervical LN as well as in the brain. Brain Tregs are attracted through chemokines such as CCL1 and CCL20, and they then proliferate in response to IL-2, IL-33, and serotonin. Neuroprotective factors such as Areg produced by brain Tregs suppress excessive activation of microglia and astrocytes, thereby promoting neural cell recovery (Figure 7). The molecular mechanism whereby Tregs acquire brain-specific characteristics, including serotonin receptor expression, should be elucidated, and this mechanism could be used for increasing Tregs in the brain. It is also important to elicit other mechanisms involving Tregs in neural recovery. In the future, it may be possible to administer autologous Tregs directly into the brain for the treatment of cerebral inflammation . It is also important to define the role of brain Tregs in other neuroinflammatory diseases, including multiple sclerosis, or in neurodegenerative disorders such as Alzheimer's disease. This work was supported by JSPS KAKENHI (S) JP17H06175, Challenging Research (P) JP18H05376, and AMED-CREST JP18gm0510019 and JP18gm1110009 for A.Y., the Takeda Science Foundation, the Uehara Memorial Foundation, the Kanae Foundation, and the SENSHIN Medical Research Foundation, Keio Gijuku Academic Developmental Funds. MI and AY contributed to the writing of the manuscript. Review and editing was performed by TS and TN. Organization WH. The top 10 causes of death (fact sheet updated january 2017). 2018. Näslund O, Smits A, Förander P, Laesser M, Bartek J, Gempt J, et al. Amino acid tracers in pet imaging of diffuse low-grade gliomas: A systematic review of preoperative applications. Acta Neurochirurgica. 2018: 1-10. Jones A, Hawiger D. Peripherally induced regulatory t cells: Recruited protectors of the central nervous system against autoimmune neuroinflammation. Front Immuno. 2017; 8.